"The Code's specificity throws the ancient world into stark relief." The Code of Lipit-Ishtar pre-dates the better-known Law Code of Hammurabi, circa 1780 BC. 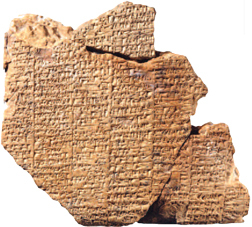 His Code of law was discovered by a University of Pennsylvania archaeological team in 1899, at first a single fragment but then in total, four fragments (see image below, of three of the four tablets together) of a once intact tablet upon which the entire Code had been inscribed - it took cuneiformists (scholars who study and translate cuneiform texts written on clay tablets with an engraving stylus using a wedge-shaped script) thirty years to determine what exactly they had found. 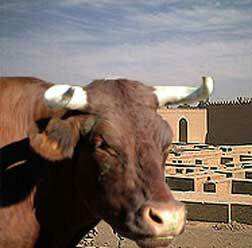 The location of the find was the site of the ancient city of Nippur (situated in modern day Iraq). One of the most exciting elements of the fragments was that archaeologists were able to decipher the name of the codifier: Lipit-Ishtar. From the four fragments, archaeologists have concluded that the original tablet was 11 inches in height. Unfortunately, the four fragments do not present the entire original tablet. Just as with the Babylonian Code of Hammurabi, the Sumerian Code of Lipit-Ishtar begins with a long preamble glorifying the exploits of Lipit-Ishtar, and of his reign in the Sumerian city of Isin (just South of Nippur). Apparently, Lipit-Ishtar was chosen by the gods to "establish justice in the land" and "bring well-being to the Sumerians and Akkadians" and that the Code caused "righteousness and truth to shine forth". The code concludes with an epilogue, and what appears to be a Raiders of the Lost Ark-like warning: curses on any person who disregards or disrespects the code, including the requisite list of gods to back the curses up (including Anu and Enhil). This is similar to the Babylonian code of Hammurabi, although Hammurabi (1810-1750 BC) extolled the virtues of a god called Marduk (Isin worshipped different gods called Anu and Enlil). Hammurabi's preamble and epilogue were much longer than Lipit-Ishtar's. The first half of the Lipit-Ishtar Code has never been found and remains a mystery but the rest presents a fascinating legal code, a looking-glass, riveting glimpse into the daily life of early human societies and civilization, governing the use of boats, real estate transactions (especially orchards), a system of slavery, peerage, inheritance, marriage and the regulation of cattle (oxen). Here is what has been translated from the fragments as they are available in 2011 AD. It is hoped that one day further fragments will be found which may clarify or confirm some of the translations and fill-in all the blanks. The following text is based on the translation offered by Francis Steele in his 1948 paper with lost text noted with "..."
8. If a man gave bare ground to another man to set out as an orchard and the latter did not complete setting out that bare ground as an orchard, he shall give to the man who set out the orchard the bare ground which he neglected as part of his share. 9. If a man entered the orchard of another man and was seized there for stealing, he shall pay ten shekels of silver (Ed. note: 1 shekel = about 1/3 of an ounce or 11.5 grams). 10. If a man cut down a tree in the garden of another man, he shall pay one half mina of silver (Ed. note: about 1.2 pounds). 11. If adjacent to the house of a man, the bare ground of another man has been neglected and the owner of the house had sent to the owner of the bare ground, "because your ground has been neglected someone may break into my house: strengthen your house," and this agreement has been confirmed by him, the owner of the bare ground shall restore to the owner of the house any of his property that is lost. 12. If a slave girl or slave of a man has fled into the heart of the city and it has been confirmed that he or she dwelt in the house of another man for one month, he shall give slave for slave. 13. If he has no slave, he shall pay 15 shekels of silver. 14. If a man's slave has compensated his slave ship to his master and it is confirmed that he has compensated his master two-fold, that slave shall be freed. 15. If a miqtum (servant) is a grant of the King, he shall not be taken away. 16. If a miqtum went to a man of his own free will, that man shall not hold him. He (the miqtum) may go where he desires. 17. If a man without authorization binds another man to a matter of which he had no knowledge, that man is not affirmed (i.e. legally obligated); the first man shall bear the penalty in regards to the matter to which he had bound him. 24. If this second wife whom he had married bore him children, the dowry which she brought from her father's house belongs to her children but the children of his first wife and the children of his second wife shall divide equally the property of their father. 27. If the man's wife has not borne him children but a harlot from the public square has borne him children, he shall provide grain, oil and clothing for that harlot. The children which the harlot has borne him shall be his heirs, and as long as his wife lives the harlot shall not live in the house with the wife. 28. If a man has turned his face away from his first wife (...) but she has not gone out of the house, his wife which he married as his favorite is a second wife. He shall continue to support his first wife. 34. If a man rented an ox and injured the flesh at the nose ring, he shall pay one third of its price. 35. If a man rented an ox and damaged its eye, he shall pay one half of its price. 36. If a man rented an ox and broke its horn, he shall pay one fourth of its price. 37. If a man rented an ox and damaged its tail, he shall pay one fourth of its price. IN ACCORDANCE WITH THE TRUE WORD OF UTU, I CAUSED SUMER AND AKKAD TO HOLD TO TRUE JUSTICE. WHEN I HAD ESTABLISHED THE WEALTH OF SUMER AND AKKAD, I ERECTED THIS STELE (i.e. tablet). MAY HE WHO WILL COMMIT AN EVIL DEED WITH REGARDS TO (this stele), WHO WILL NOT DAMAGE MY WORK, WHO WILL NOT ERASE ITS INSCRIPTION, WHO WILL NOT WRITE HIS OWN NAME UPON IT - BE PRESENTED WITH LIFE AND BREATH OF LONG DAYS - MAY HE RISE HIGH IN THE EKUR; MAY ENLIL'S RIGHT FOREHEAD LOOKED DOWN UPON HIM.